I came upon an article about Cthulhu: A Puppet Play, which will be shown at the Texas A&M-Commerce University Playhouse this weekend. It looks wonderful… but if you can’t make it to Texas, you can watch it on Youtube (below)! 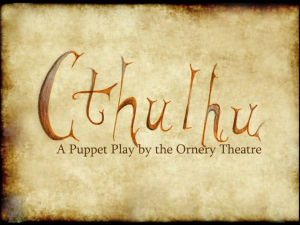 Even though the latest University Playhouse production is called “Cthulhu: A Puppet Play,” the eerie, downright scary multimedia theatrical presentation is definitely not for kids. Inspired by the the writings of horrormeister H.P. Lovecraft, playwrights Kelly Switzer and Michael Switzer have created a macabre and terrifying tale utilizing ingenious life-size puppets, film and an ominous percussive score. Directed by Kelly Switzer and Chelsea Pearce, “Cthulhu: A Puppet Play” entertains, fascinates and scares the bejesus out of the audience who become riveted by the increasingly desperate situation of the professor’s nightmarish new reality.